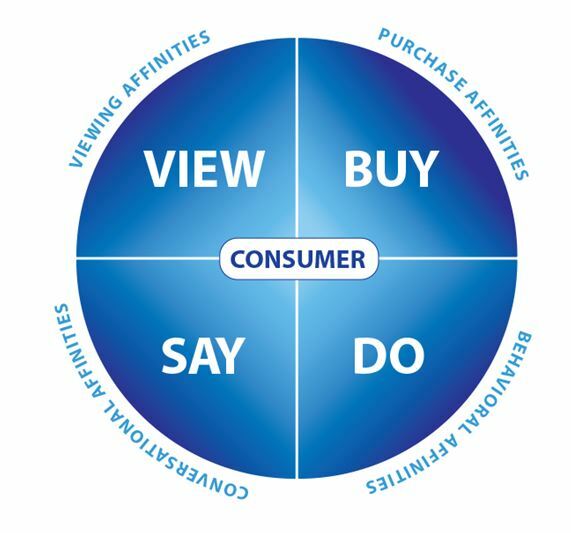 Despite years of online targeting, the idea of having a complete, holistic “360 degree view” of the consumer has been somewhat of a unicorn. Today’s new DMP landscape and cross-device identification technologies are starting to come close, but they are missing a key piece of the puzzle: the ability to incorporate key social affinities. Viewing Affinities: Where they go online and what they like to look at provides strong signals of what they are interested in. Nielsen, comScore, Arbitron and others have great viewership/listenership data that is strong on demographics, so we can get a great sense of the type of folks a certain website or show attracts. This is great, but brands still struggle to align demographic qualities perfectly with brand engagement. 34 year old men should like ESPN, but they could easily love Cooking.com more. Buying Affinities: What about a person’s buying habits? Kantar Retail, OwnerIQ, and Claritas data all tell us in great detail what people shop for and own—but they lack information on why people buy the stuff they do. What gets folks staring at a shelf to “The Moment of Truth” (in P&G parlance) when they decide to make a purchase? The buying data alone cannot tell us. Conversational Affinity: What about what people talk about online? Radian6 (Salesforce), Crimson Hexagon, and others really dig into social conversations and can provide tons of data that brands can use to get a general sense of sentiment. But this data, alone, lacks the lens of behavior to give it actionable context. Social Behavioral Affinity: Finally, what about the actions people take in social environments? What if we could measure not just what people “like” or “follow” online, but what they actually do (like post a video, tweet a hashtag, or engage with a fan page)? That data not only covers multiple facets of consumer affinity, but also gives a more holistic view of what the consumer is engaged with. Adding social affinity data to the mix to understand a consumer can be a powerful way to understand how brands relate to the many things people spend their time with (celebrities, teams, books, websites, musicians, etc.). Aligning this data with viewing, buying, and conversational data gets you as close as possible to that holistic view. Looking through the lens of social data, you might also measure forward affinity: how many social fans of Whole Foods expressed a Facebook “like” for Beyonce, or followed her account on Twitter? This measurement has some value, but fails at delivering relevance because of the scale effect. In other words, I like Beyonce, so does my wife, and so does my daughter . . . along with many millions of other fans—so many that it’s hard to differentiate them. The more popular something is, the broader appeal and less targetability that attribute has. So, how do you make social affinity data relevant to get a broader, more holistic, understanding of the consumer? As an example, this approach was recently employed by Pepsi to choose Nicki Minaj as their spokesperson over several other well-known celebrities. What else can social affinity data do? Brands can use social affinity data to decide what content or sponsorships to produce for their users. Looking at their users’ mutual affinity between the brand and music, for example, might suggest which bands to sponsor and blog about. A publisher’s ad sales team can use such data to understand the mutual affinity between itself and different brands. A highly correlated affinity between activated social visitors to GourmetAds’ Facebook page and those who post on Capital One’s Facebook page may suggest a previously unknown sales opportunity. The publisher can now prove that his audience has a positive predisposition towards the brand, which can yield higher conversions in an acquisition campaign. What about media buying? Understanding the social affinity of fans for a television show can produce powerful actionable insights. As an example, understanding that fans of “Teen Wolf” spend more time on Twitter than Facebook will instruct the show’s marketing team to increase tweets—and post more questions that lead to increased retweets and replies. Conversely, an Adult Swim show may have more Facebook commenters, leading the marketer to amplify the effect of existing “likes” by purchasing sponsored posts. Keyword buying is also interesting. Probing the mutual affinities between brands and celebrities, shows, music acts, and more can yield long tail suggested keyword targets for Google, Bing/Yahoo, and Facebook that are less expensive and provide more reach than those that are automatically suggested. As an example, when “Beavis and Butthead” re-launched on MTV, Google suggested keywords for an SEM campaign such as “Mike Judge” (the show’s creator) and “animated show.” Social affinity data suggested that socially activated Beavis fans also loved “Breaking Bad.” Guess what? Nobody else was bidding on that keyword, and that meant more reach, relevance, and results. I believe that understanding social affinity data is the missing piece of the “360 degree view” puzzle. Adding this powerful data to online viewing, buying, and social listening data can open up new ways to understand consumer behavior. Ultimately, this type of data can be used to generate results (and measure them) in online branding campaigns that have thus far been elusive. Want a full view of the people who are predisposed to love your brand? Understand what you both mutually care about through social affinities—and measure it. Next Post → I See Dead People… Responding to my Marketing!